From our friends at illuminate—an incredible journal that celebrates urban living & luscious plants—comes a recipe for painted beets sure to brighten dark winter days. Plants make people happy. It’s no scientific secret that being around green life is good for physical and emotional wellbeing. Yet, interacting with plants and nature is not completely accepted as an essential component of a healthy lifestyle and instead is thought of as a “bonus” or “complement” to overall wellbeing. In addition, nature and plants are usually associated with the outdoors. At the same time, 50% of today’s global population lives in cities with potentially limited access to green spaces. That’s why we founded Bulbo: with an aim to integrate nature into daily life through light for plants. As a young Italian design company producing carefully crafted LED lights for indoor gardening, our goal is to inspire urban dwellers to expand their perception of the natural world through a better understanding of plants, regardless of their geographical location or outdoor growing conditions. While Bulbo creates physical products, the launch of our digital journal illuminate cultivates an intellectual space to inspire, invoke and challenge all of us living in cities to seek an alternative relationship with the vegetal world. One of the best ways to appreciate nature in an urban context is through food. If you’re growing and preparing your own vegetables there’s a certain awareness to the rhythms of natural life. At the same time, the upside of growing indoors is that you can combine traditional seasonal dishes with exotic fresh flavours any time of year. With the help of Badeggs, an Italian culinary startup promoting fresh food, community engagement and happy eating, we’re introducing simple recipes with good food grown at home. And as cold weather approaches, it’s natural to seek warming comfort food. An Italian risotto is a great solution. 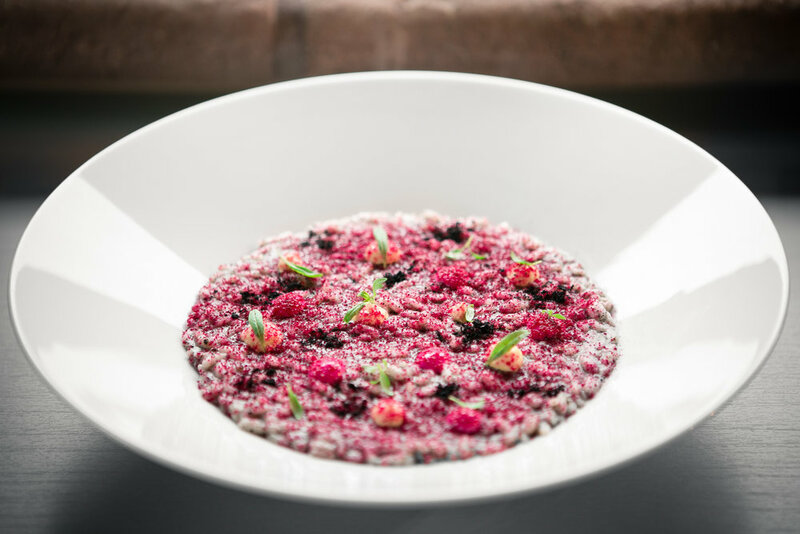 With baby beets and summer savory straight from under the Quadra’s gaze, we put together a gorgeous rice dish that looks like a work of art but is actually easily prepared with minimal prep. Beets grown indoors often yield smaller bulbs and bigger leaves, but the baby bulbs you will harvest are still bright, beautiful and full of intensity. Here the beets add a splash of colour and a burst of flavour in an otherwise basic risotto. A sprinkling of pulverised charred shallot gives the rice an exotic dark colour and interesting depth to the dish. Topped with fresh summer savoury, a fragrant herb that reminds us of long days in the sun, the dish comes out plated to perfection and offers a brilliant bite that will wow your guests. Peel the shallot and roast it in the oven at 250° until it has become completely burnt. It should be black and dry even on the inside. Pulverise into a powder with a blender. Wash the mini beets, removing the greens (save them for a salad!) and cutting off the root tip. Dress the mini beets with olive oil, salt, pepper and dried or fresh herbs, like sage and rosemary and put them on a baking tray keeping the two colours separate. Roast in the oven at 180° for about 20 minutes. Peel the yellow beets and puree them with half the mascarpone and a teaspoon of olive oil in a blender. Do the same, separately, with the red beets. Toast the rice in a heavy bottomed pan with about 30 g of butter for about five minutes, until the rice becomes transparent. Add the vegetable broth a ladleful at a time, adding more as it absorbs, and continue to cook until done. Stir in the remaining butter, Parmigiano, two-thirds of the ashes and a tablespoon of oil. Plate and garnish with the beet cream in different colours, dashes of the ash, and abundant leaves of summer savory. A version of this article was originally published on illuminate, a digital journal for plant-lovers around the world.